Outdoor TVs are exactly what their name says. They are TVs built specifically for outdoor installation, like in a covered patio, on the porch, and at poolside. But shopping for the best outdoor TVs is more difficult than when hunting for indoor TVs. There are much fewer options on the market, so you’ll have to dig deep to find the best products. We’re here to make shopping for outdoor TVs a lot easier for you. In this guide, we’ll introduce you to the best options currently out. But before you start shopping, make sure you know exactly where you are going to install your TV. Different settings call for a different kind of outdoor TV. Some outdoor TVs are designed for a shaded area while others are built for full sunlight conditions. Additionally, when shopping for outdoor TVs, it’s best to keep your expectations at a reasonable level, especially with regard to overall picture quality. Outdoor TVs can be really bright, which is necessary for outdoor use. But modern indoor TVs offer better picture quality and more features, not to mention they are more affordable. That said, this guide also includes indoor TVs that will work well when installed for outdoor use, provided you secure them in a rugged enclosure for protection. If true outdoor TVs are too expensive for you, consider the products mentioned in this guide’s latter half instead. 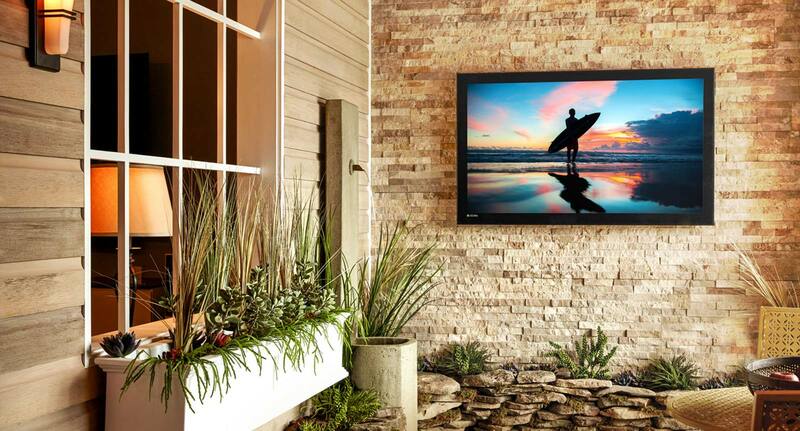 When it comes to true outdoor TVs, California-based SunBriteTV is often considered one of the best, offering a series of displays designed for different outdoor setups. For those looking for an outdoor TV suitable for a covered area, such as a covered patio, SunBriteTV offers the SB-4374UHD. A part of the Veranda series, the 43-inch SB-4374UHD is a relatively affordable outdoor TV, selling for around $1,500. It’s as rugged as SunBriteTV’s more premium models but comes with fewer features. The SB-4374UHD is housed in a rigid aluminum case with well-secured electronics. It’s protected against snow, rain, and extreme temperatures, among other things, though it’s not a recommended unit in an uncovered area despite this. The connection ports are easy enough to access, but not when the TV is already mounted on the wall. A 4K TV, the SB-4374UHD has built-in speakers, which seems like a good thing until you hear the actual sound quality. SunBriteTV advertises this product for outdoor use, but the speakers are definitely not built for that setting – they are rather weak and are best ignored in favor of external speakers, especially when watching sports. The SB-4374UHD is easy to set up out of the box. SunBriteTV offers excellent customer support should you need help during the initial setup. On the other hand, this outdoor TV has a very limited user interface, with not many options to choose from, which is quite disappointing. The unit’s remote control is also a bit lackluster. As mentioned, the SB-4374UHD is not that rich when it comes to bells and whistles, so don’t expect too much. Concerning overall picture quality, the SB-4374UHD is good for an outdoor TV. It has good color reproduction and an acceptable native contrast. However, it’s got a few issues that might persuade you to increase your budget and go for a more premium product instead. First off, it has subpar glare handling. And second, it has below-average viewing angles, though the picture quality drop-off is not that dramatic when viewed from the side. The SB-4374UHD is best used for watching movies and sports at nighttime. It has a good response time, which makes it suitable for content with a lot of fast-paced motion. On the other hand, the SB-4374UHD might not be suitable for local multiplayer gaming with your squad – its input lag is not that great compared to indoor TVs. Overall, the SB-4374UHD is a good option for a shaded outdoor area. It’s built like a tank and has a good picture quality for a low-end outdoor TV. If you can’t afford to spend too much for a true outdoor TV, the SB-4374UHD is an excellent choice. For partial sunlight conditions, the SunBriteTV SB-S-43-4K is much more ideal than the SB-4374UHD. It’s got a brighter panel and better glare handling and is much better overall when used during the day. It sells for nearly $3,000, placing it in the same price range as some of the best high-end indoor TVs on the market. In design, the 43-inch SB-S-43-4K is very similar to the SB-4374UHD, with more focus on function than form. It has thick bezels all around and comes with multiple connection options, including HDMI, all of which are well-secured on the back panel. It’s got an aluminum casing built for all-weather protection and an anti-glare screen. The electronics are well protected against snow, rain, dust, and extreme temperatures. Unlike the SB-4374UHD, the SB-S-43-4K does not include built-in speakers, so you need to connect it to external speakers – preferably rugged and weatherproof speakers. It’s a bummer that there are no speakers in this thing, considering the price. And speaking of disappointing things, the SB-S-43-4K’s remote control and menu/user interface are not that great: the former is not intuitive while the latter has limited options. Setting up the SB-S-43-4K at the onset is fairly easy. It’s easy to mount on the wall, but if you want to set it up on a table like a normal TV, you’ll need to purchase the stand separately, which some will find utterly ridiculous considering the price. Keep in mind that the SB-S-43-4K is not a smart TV, so don’t expect to be able to use apps that require an internet connection. In terms of picture quality, the SB-S-43-4K is kind of a mixed bag. On one hand, it’s got enough brightness to produce clear images in partial sunlight conditions. It has good viewing angles, a decent native contrast ratio, and a fairly fast response time. In addition, it has a much better input lag than the SB-4374UHD, making it more suitable for local multiplayer gaming. On the other hand, it has slightly inferior color reproduction compared to the Veranda series. Still, it’s a good outdoor TV, with its good motion handling making it suitable for sports and movies with a lot of fast-paced action – but don’t expect extremely accurate colors and very deep blacks. If what you seek is an outdoor TV suitable for partial sunlight conditions, the SB-S-43-4K, which is part of the SunBriteTV Signature Series, is one of the best options on the market. It has a decent picture quality, offers multiple connection options, and boasts a weatherproof casing. The 32-inch SB-3211HD is even more suited for outdoor use than the two SunBriteTV models above. It’s a part of the SunBriteTV Pro Series, a lineup of outdoor TVs designed for full sunlight conditions. If you want a TV that you can mount by the pool or on the deck, the SB-3211HD is for you. It sells for over $3,000, which makes it pretty much inaccessible to most normal folks. As with other SunBriteTV products, the SB-3211HD clearly prioritizes function over form. It has a rather unappealing design, with thick borders that will make some of you cringe. It has a clean back panel with a well-secured compartment for the inputs. The casing, as usual, is made of aluminum and has been optimized to survive the elements, including rain and snow. It has an impact-resistant, anti-glare screen. The SB-3211HD has a detachable soundbar, which can be mounted at the top or bottom for flexibility. The soundbar has good sound quality and can get very loud, but don’t expect it to be on the same level as dedicated external speakers. Like the TV itself, the soundbar is also weatherproof, so there’s no need to secure it in a separate enclosure. For a $3,000 TV, the SB-3211HD is not that rich when it comes to features. It’s more about being rugged than offering useful features. The on-screen menu could be improved, and the included remote control is not as intuitive as you might expect from an expensive product. The SB-3211HD is as tough as advertised and performs really even when exposed to direct sunlight. It’s an ultra-bright TV with great reflection handling and good viewing angles. It has good color accuracy and a fast response time, but its native contrast ratio is subpar. Unlike the Veranda series, the SB-3211HD offers good picture quality during both daytime and nighttime, which makes it a suitable entertainment system when hosting daytime barbecue parties as well as watching big sports games in the evening. On the flip side, the SB-3211HD’s native resolution is only 1920 x 1080, with no 4K UHD option currently being offered even for the larger, more expensive Pro Series models. Wrapping up, the SB-3211HD is an excellent outdoor TV for full sunlight conditions. It has a great cooling and heating system, comes with a detachable soundbar, and has a good overall picture quality. It’s got a low input lag, too, which makes it suitable not only for watching movies and sports but also for playing local multiplayer games with your friends. If money is not an issue for you, the SB-3211HD, and the entire SunBriteTV Pro Series itself, is a good option. SkyVue is another notable brand when it comes to true outdoor TVs. The American company offers a wide selection of products for both residential and commercial use. One of the best units currently being offered is the R-NXG-32000-FS, a 32-inch TV built for full sunlight conditions. It sells for about $2,900 on a non-sale day, making it slightly more affordable than the SunBriteTV SB-3211HD. The R-NXG-32000-FS is a well-built outdoor TV and is designed for permanent outdoor installation. It’s got a rugged aluminum casing built for all-weather protection, and that includes protection against rain and snow. SkyVue offers multiple color options for this product, including black and brown. While not a smart TV by default, the R-NXG-32000-FS can be outfitted with a built-in Roku system for an additional cost, allowing you to enjoy some of the most popular video streaming apps, including Netflix and HBO Go. You can also purchase several other add-ons or accessories, such as a protective cover, an internal audio system, and a table stand. An outdoor TV built for areas regularly exposed to the elements needs to have well-secured connection ports. SkyVue accomplishes that, securing the R-NXG-32000-FS’s input ports in an effective manner on the back panel. The input ports, which include HDMI and VGA, are easy to access during the initial setup, but not when the TV is already mounted on the wall. The R-NXG-32000-FS comes with a rather generic-looking remote control. It’s easy enough to use, featuring responsive, clearly labeled buttons. The same thing can be said about the on-screen menu: it’s not that difficult to navigate but the design could be better. When it comes to picture quality, the R-NXG-32000-FS is just as advertised. It’s excellent for full sunlight conditions, like in an uncovered patio or at poolside, boasting an extremely bright panel capable of producing clear images even when the sun’s in full blast. It has decent viewing angles for an outdoor TV and good reflection handling. Some will be disappointed with the R-NXG-32000-FS’s native full HD (1920 x 1080) resolution, though, especially considering the popularity of 4K UHD. But keep in mind that when shopping for TVs designed for outdoor use, most especially those built for full sunlight conditions, you’ll want to prioritize brightness over a 4K screen. SkyVue also offers 4K TVs for direct sunlight exposure, but none of them are as bright as the R-NXG-32000-FS. If the SunBriteTV SB-3211HD is too expensive for you, consider the slightly cheaper R-NXG-32000-FS from SkyVue. It’s got similar specs and offers the same rugged construction that gives it full protection against the elements. Mirage Vision operates differently than most other outdoor TV brands. The Las Vegas-based company does not manufacture its own TVs. Instead, it uses indoor TVs from popular brands such as Samsung and LG and then retrofits them into an outdoor TV. Of Mirage Vision’s products, the MV 55-GS-U-4K stands out as one of the best for partial sunlight conditions. It’s part of the Gold Series, the most popular of Mirage Vision’s product lineup. Or more specifically, it’s from the Gold Ultra Series, which is composed of units with a native 4K UHD resolution. The MV 55-GS-U-4K is a 55-inch smart TV that comes in a well-secured frame with sealed electronics. It’s built to withstand extreme temperatures and is more than capable of surviving a few drops of rain. It has HDR support and comes with multiple connection ports for versatility, including USB. The MV 55-GS-U-4K has built-in speakers, but they are not that good, especially for watching sports games with a large group. We recommend that you connect it to a more powerful audio system for the best experience. Considering the MV 55-GS-U-4K is built around an indoor TV, it’s no surprise that it comes with a good picture quality. It’s got good contrast and viewing angles and can produce accurate and vibrant colors. However, since it’s not really built for full sunlight conditions, it’s not as bright as the SkyVue R-NXG-32000-FS, so don’t even think about installing it for poolside use. The MV 55-GS-U-4K, which normally sells for around $2,300 in its stock form, is a good option if you want an outdoor TV for partial sunlight conditions. It has good picture quality with a fast response time, comes in a weather-resistant cabinet, and includes smart TV features. Setting up an outdoor entertainment system doesn’t necessarily mean you need to buy an actual outdoor TV. You can also go for indoor TVs, which are better than true outdoor TVs in a lot of aspects, especially with regard to picture quality. But for an indoor TV to survive in an outdoor setup, you’ll need to outfit it with a rugged, weatherproof enclosure. Keeping it in its default setup with no form of protection against the elements is like giving it a quick death sentence. If spending over $500 for a TV is too much for you, consider the Sony X720E. It’s one of the more affordable TVs that you can get for an outdoor setup, with the 43-inch model selling for just under $500. A LED TV with an IPS panel, the X720E is best placed in a shaded area, preferably with a dedicated audio system, as the built-in speakers are not that good. The X720E has a good build quality, though most of it is plastic. It has a simple, clean design with thin borders and a wide stand. It’s easy to install for a wall-mounted setup and comes with easily accessible inputs on the back panel. Most inputs run along the side edge, making them easy to access when the X720E is mounted on the wall. The rear inputs, on the other hand, are slightly more difficult to access. Setting up the X720E out of the box is fairly easy. It has a simple user interface and comes with a neat remote with shortcut buttons for YouTube and Netflix. While the UI is easy enough to navigate, the default app selection is very limited compared to other smart TVs, so don’t expect to see a lot of options on that front. A 4K TV with HDR support, the X720E is an all-around TV suitable for movies, TV shows, sports, and even gaming. It’s got a good overall picture quality, with decent brightness and reflection handling. Compared to a TV with a VA panel, the X720E has great viewing angles, making it an excellent TV for keeping a large group of people entertained, like when watching big NBA or NFL games with your buddies. The X720E has a fast response time and good motion handling overall, which makes it a good TV for content with lots of motion, like action-packed movies. It’s also an excellent option for weekend multiplayer gaming sessions with your friends. It’s got a very low input lag, perfect for titles that require quick reactions, such as Street Fighter 5 and fast-paced sports simulation games. On the flip side, the X720E isn’t the most ideal in a dark environment. It has a subpar native contrast ratio, even for a TV with an IPS screen, so don’t expect to get very deep blacks when viewing content with a lot of dark scenes. The X720E is best used in a well-lit environment, but don’t mount it in an uncovered area with direct exposure to sunlight – it’s not bright enough for such a setting. As mentioned, the X720E’s built-in speakers are not that good. They are probably decent enough for some people and can get very loud, but the performance is subpar at high volumes, which might disappoint those expecting more from a Sony product. We recommended that you hook up the X720E to a more powerful audio system, especially if you’re going to use it for sports. Overall, the X720E is a solid outdoor TV option for those with a tight budget. It has great viewing angles and decent reflection handling and produces good picture quality. But as expected from a relatively affordable option, the X720E comes with some limits, though none of which are deal-breakers. The LG SK9000 is a mid-range 4K TV with two size options, 55-inch and 65-inch, with the former being the more affordable at just under $900. It’s a great option for a wall-mounted outdoor TV in a shaded area, featuring good viewing angles and brightness. As with most other LG TVs, the SK9000 is a well-designed unit with good build quality from top to bottom. It has thin borders and comes with a thin, curved stand with a metallic finish. It has a clean back panel with cable management and includes lots of input options. The input ports are divided into two sets: one is at the rear while the other is side-facing on the back panel edge for quick access. The SK9000’s user interface is responsive and includes a good number of apps by default, including some of the most popular ones. The unit comes with a large, well-organized remote control with shortcuts to common functions. Additionally, the SK9000 has the LG ThinQ smart assistant and works with Amazon Alexa, making it a far better smart TV than the Sony X720E. Concerning sound quality, the SK9000 is decent enough, so you don’t need to connect it to external speakers as soon as possible. It can get very loud, though the sound quality takes a hit at high volumes. While the SK9000’s sound quality is decent enough, we still recommend that you pair it with a more powerful audio system for a better experience when watching movies and sports. The SK9000 is a LED TV with an IPS panel and HDR support. It has good viewing angles, which means the picture quality remains accurate even when viewing from the side. This makes it an excellent outdoor TV for watching big sports games with a large group of people. In addition, it has good reflection handling and brightness, but we don’t recommend it for usage in a completely uncovered area with direct sunlight exposure. As mentioned earlier, the SK9000 is best used in a shaded area. For fast-paced action movies and other content with a lot of motion, the SK9000 is a great option, courtesy of its fast response time. This means movies directed by Michael Bay, as well as movies under the Marvel Cinematic Universe, will look fantastic on this TV. Furthermore, the SK9000 is an excellent choice for gaming, boasting a low input lag across different resolutions. If you want an outdoor TV specifically for multiplayer gaming sessions with your friends, consider this LG product. Although the SK9000 has a decent native contrast for an IPS display, it’s still not as good as other LG TVs with VA panels, which offer an excellent contrast ratio. It can’t produce very deep blacks and doesn’t offer the best picture quality in a dark setting. As with most other IPS displays, the SK9000 works best in a well-lit area. The SK9000 is a great mid-range TV that works well for outdoor use, all things considered. It has a well-designed frame with easy-to-access inputs and boasts good picture quality and viewing angles. It’s a solid all-around TV for different types of content, including sports and video games. An OLED TV is also a good option for outside use – but under the right circumstances. Since OLED screens are more sensitive to sunlight exposure than regular backlit displays, they are best used as entertainment systems in a covered area during nighttime. When the sun’s still out, it’s best to keep them well covered and protected against sunlight. If that kind of setup works for you, consider the LG C8, one of the best OLED screens currently out on the market. LG offers it in three sizes, with the 55-inch model going for around $1,700 a pop. It’s expensive, sure, but compared to a true outdoor TV at the same price, it’s significantly better, offering a fantastic picture quality and great viewing angles. The C8 is a 4K TV with a well-constructed frame. It has thin borders, a clean back panel, and a very thin frame overall. The upper half is considerably thinner than the lower half, where the main electronics reside. Make sure to handle it with care when moving it around, most especially when mounting it on the wall, as the extremely thin upper frame might get damaged. At the back, you’ll find a simple cable guide for convenient cable management. All inputs are on the back panel’s edge, separated into two sets: one’s side-facing for quick access while the other’s outward-positioned, which can make it a bit difficult to access in a wall-mounted setup. For direct control, the C8, like other modern LG TVs, comes with a joystick control on the back panel that makes navigating the user interface intuitive. The C8’s user interface is very responsive and easy to use. It’s got a good selection of apps right from the start, including popular ones such as Netflix. The C8 comes with a remote control similar to that of the LG SK9000, with quick access to common functions. And just like that model, the C8 has LG’s ThinQ smart assistant and works with Amazon’s Alexa. Of the TVs mentioned in this guide, the C8 offers the best picture quality overall, which isn’t surprising considering it’s an OLED screen. It’s got excellent color reproduction and can produce perfect blacks, making it ideal for content with a lot of dark scenes, such as horror movies. In addition, it has good reflection handling and brightness and boasts an exceptionally fast response time, which makes it perfect for sports and action-packed movies. The C8 is also an excellent TV for multiplayer gaming sessions with your squad. It’s got a very low input lag across different resolutions, perfect for games such as Rocket League, Tekken 7, Injustice 2, and Gran Turismo Sport. Single-player games with gorgeous visuals like Far Cry 5, Marvel’s Spider-Man, and The Witcher 3: Wild Hunt are also great on the C8, courtesy of its 4K native resolution and excellent picture quality overall. As with other OLED TVs, the C8 has a permanent burn-in risk, one of the main reasons some people stay away from such products. On the plus side, the C8 has options to help reduce burn-in, but don’t expect to be able to completely side-step that risk. While the C8 only works as an outdoor TV under very specific circumstances, it’s a solid option nonetheless, especially for those who want the best picture quality. It’s a premium product that works great for pretty much all types of content, is easy to set up, and has a good sound quality with a punchy bass.